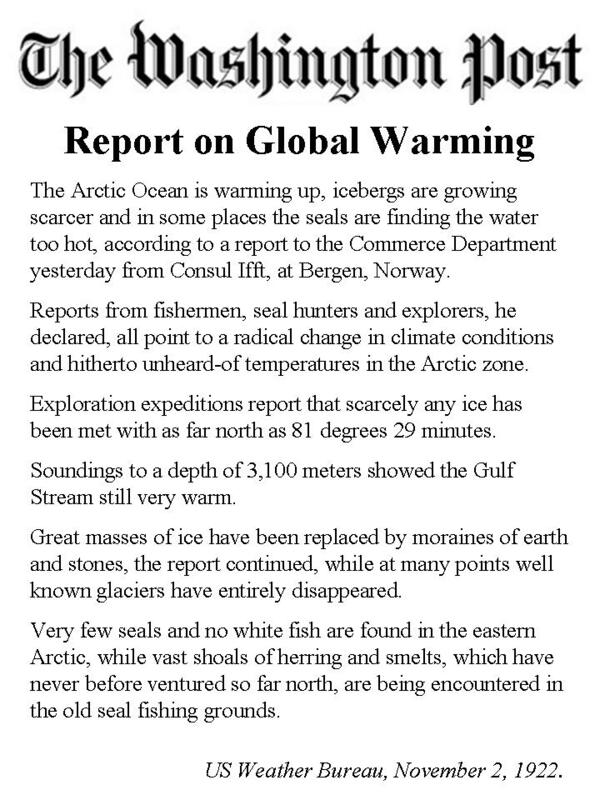 RogerfromNewZealand has a very clear and interesting site called Global Warming (or is it Global Cooling?). It brings together most of the main points of the scam in a way that’s easy to follow. Roger’s version of The Emperor’s New Clothes, above, definitely goes in my “Wish I’d thought of that” file. I’ve long thought the Hans Christian Anderson story (ironically written in Copenhagen) was the perfect analogy for global warming and other scams. Roger’s reasons for each character’s inclusion are well worth a read. Rudd pushes Aussie ETS back 3 years. Key’s Big New Tax due inside 3 months. Australia’s left-wing Labor PM has just put off their ETS for at least three years. Meanwhile our left-wing National PM – who says he’s ambitious for New Zealand and claims he wants to catch up with Australian living standards – will be punishing his people with an ETS inside three months. Rudd’s backdown shows the power of new Liberal leader Tony Abbott’s campaign against “The Big New Tax”. What a shame New Zealand doesn’t have an Opposition. If we did, it could put a climate change invoice for $3000 in every letterbox, complete with a few basic facts about the real science of climate change. Then the public would know what the sceptics know, and the ETS would be a red-hot election issue. Note: according to the Doomsdayers who love to terrify our children (which includes many warmmongers), the world is going to end in December 2012. Is Rudd’s 2013 deadline just his subtle way of telling the faithful that the ETS is off for good? Thanks to reader The Silent Majority for sending me the above quote from John Key’s campaign blog. Well we are the world leader now John Key, way out in front, leading the charge, putting our businesses, farmers and exporters at risk, jobs will be lost, beef and sheep farms will convert to forestry, small rural communities will struggle, costs will go up across the board, for everyone, and our noble efforts will make not one iota of difference to the world climate. When the facts change, John Key, intelligent people are willing to change their mind. 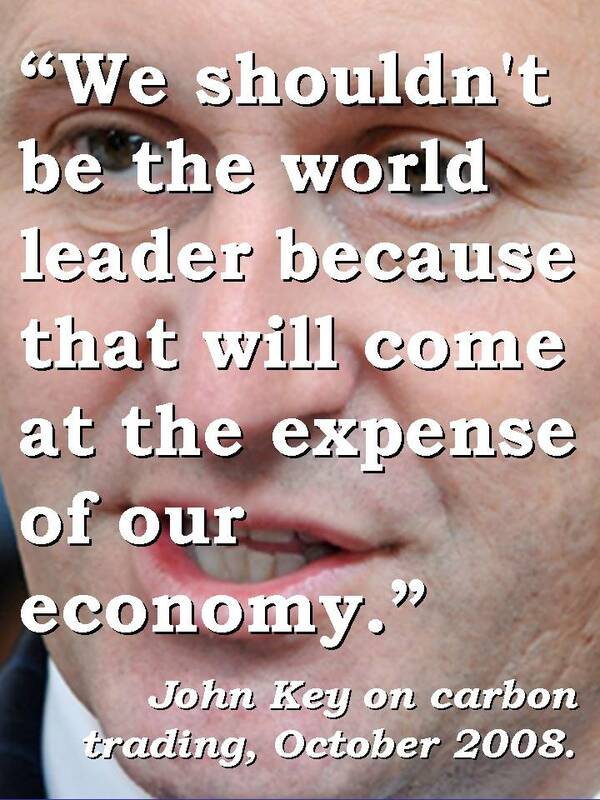 You are an intelligent man John Key, so change your mind, before it is too late. Because as Opposition Leader, he had it right. Yet as Prime Minister, little more than a year later, he became the world’s first national leader to pass a law punishing carbon-based life forms for emitting carbon. 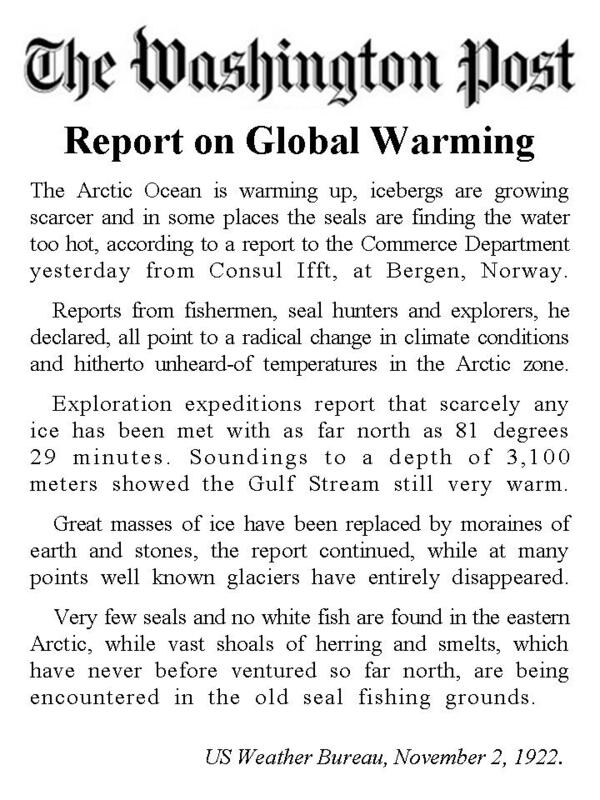 In doing so, he ignored a slew of evidence that the world has been much warmer in the past than even the most extreme warm-monger says it’s likely to get in the future – and that those warm times were times of great abundance and prosperity. He refused to look at evidence that the evidence of his advisors was not evidence at all. Instead, he chose to believe a theory put about by a discredited religious sect masquerading as scientists, who base their claims on doctored computer models that dissolve on contact with reality. John Key won’t delay the ETS, as the more sensible Australians and Americans have done. Because he simply doesn’t listen to anyone outside the NIWA/ Environment Ministry climate clique. Just as they don’t listen to anyone outside the increasingly comical IPCC (Intergovernmental Perpetrators of Climate Cockups). And so to July 1, and the aforementioned expense to our economy. Power prices up. Petrol prices up. All other prices up. All because of John Key and Nick Smith’s determination to lead the world in saddling their people with a pointless solution to a non-problem. In a future post, I’ll publish a transcript of an interview that shows you how thoroughly the PM has been captured by one side of the climate debate. In the meantime, you might ponder why John Key and Nick Smith would change their minds so completely on this issue from their time in Opposition. Could it be the Nats are locking in those female urban liberal green votes “at the expense of our economy”? When the perpetrators of the Emissions Trading Scheme are brought to account, don’t let them try to fool you that they didn’t know what they were doing. Below is a 2005 column by then-Opposition MP Nick Smith, where he argues strongly against the concept of taxing carbon dioxide. The column appeared on Nick’s website on November 25, 2005. Because it was exactly four years later, on November 25, 2009, that the same Nick Smith made this ‘madness’ law. The appetite of Dr Cullen and this Government for more taxes is legendary, 43 new and increased levies and taxes have been introduced. The latest is the carbon tax. It will add 6c per litre to the price of petrol, 7c per litre to diesel, 6% to all power bills and put the price of coal and gas up by 9%. 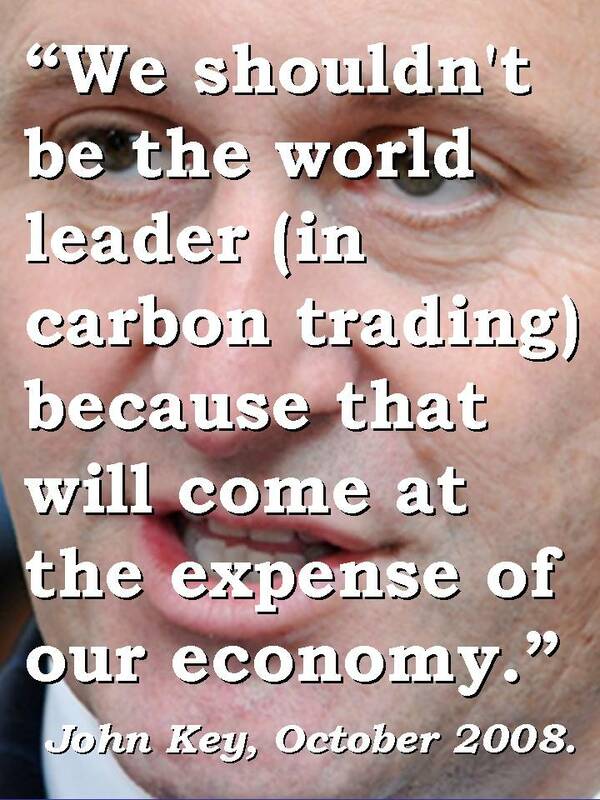 As will his own Emissions Trading Scheme, when it comes into force on July 1. This week National launches the axecarbontax.co.nz campaign. The new finely balanced Parliament gives us the opportunity to send the carbon tax the way of the fart tax. 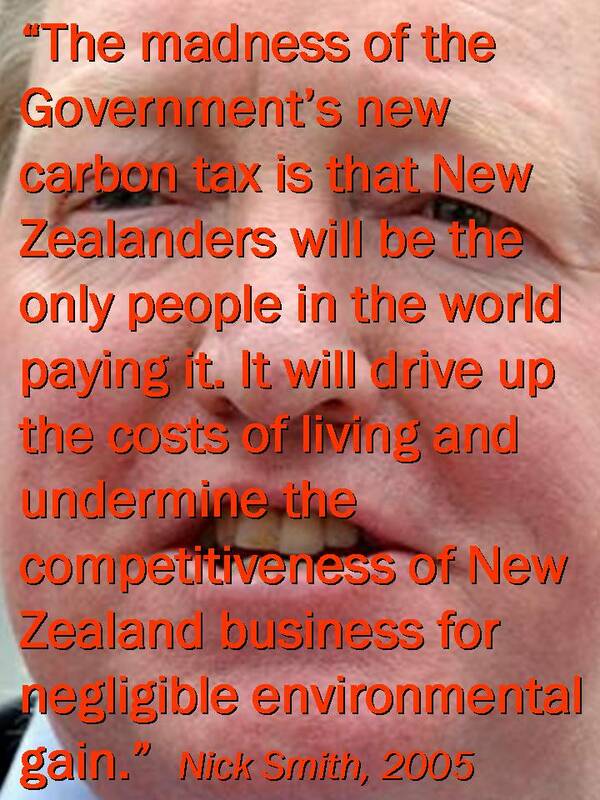 Yet in the next Parliament, which National now dominates, where did they send the carbon tax? Not the way of the fart tax. More the way of the Anti-Smacking Bill. Somehow, you foresaw that Australians would change their prime minister, then their Opposition leader, then their minds over whether to punish themselves for their use of CO2. They figured it was madness. Just like the old you once did. You correctly predicted that the Canadians would give carbon taxing a wide berth. And that the Americans won’t be doing any capping and trading any time soon. Of course, you didn’t bank of the EU bringing in their scheme. But then, as you know, it only affects 4% of their economy. While yours affects 100% of ours. But as for those other predictions – that it would drive up all our costs, undermine our economy and not change the climate one iota – on all three points, you were spot on. After July 1, every time we fill up our cars, pay the power bill or fork out record sums for everything from jeans to baked beans, we’ll be thinking of the man who made it all happen. Labour Ministers may take pride in being toasted at International Climate conferences for being so bold and brave, but there is no justification for New Zealand going out in the cold by itself on this issue. None whatsoever, Nick. So, um… why did you? New Zealand’s greenhouse gas emissions made up only 0.4% of the global total and on a per capita basis our emissions are half those of countries like Australia and the United States. We are the only Southern Hemisphere country with binding legal obligations under Kyoto and giants like China and India have got off scot free. As you say – I mean said – it’s madness. A further concern of the carbon tax is its impact on inflation, interest rates and the exchange rate. It will add to the costs of fuel and power and these flow right through the economy to basics like food. This puts pressure on inflation, which in turn drives up interest rates and the kiwi dollar. The Government’s carbon tax is a classic example of the way the Government is making things tougher for the productive exporting sector. It just makes their policies of 2006 being the ‘Year of Exports’ an exercise in shallow spin. In other words, you guys are happy to sabotage our economy, as long as John Key can stay onside with Lucy Lawless and the lady liberals? It is also interesting to note who gets exempted from the carbon tax. Big industries like Colmalco, New Zealand Steel and Golden Bay Cement have the option of Negotiated Greenhouse Agreements (NGA’s). These are being done on the basis that such big players would relocate if imposed with the carbon tax. The flaw is that many small and medium businesses face exactly the same competition but just get dumped with the cost. I don’t know enough about this part of the ETS to comment. Anyone care to fill me in? These agreements also drag New Zealand back into the Muldoonist era of industries pleading special cases to Ministers and mates rates for those who cuddle (or at least don’t criticise) the Government. Muldoon, ah yes: that other populist National Party leader who talked the centrist talk, but walked the socialist walk. 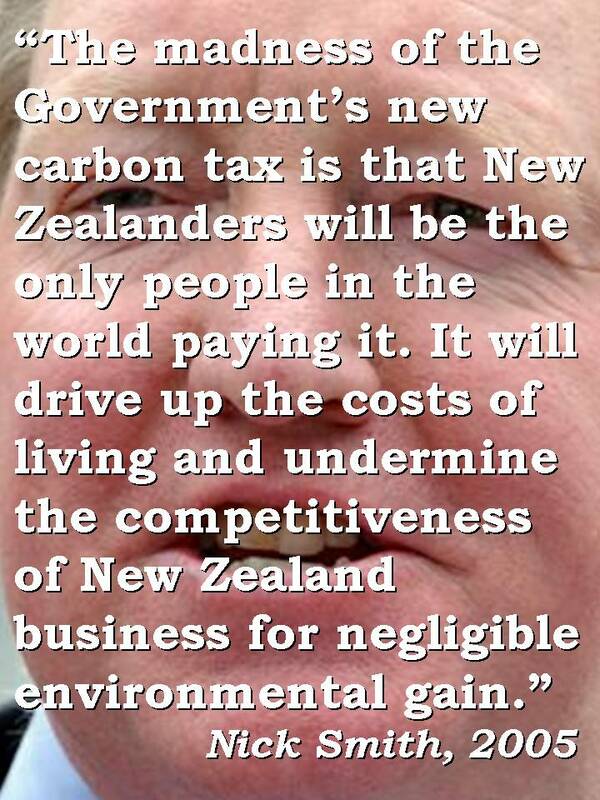 The worst aspect of the carbon tax is that it will not make one iota of difference to New Zealand’s emissions. We know from previous occasions when Labour raised the petrol tax that 6c per litre extra will not reduce consumption. Even Treasury’s briefing papers to the incoming Government conceded it would have a negligible effect. The only conclusion is that the carbon tax actually has nothing to do with Kyoto or climate change but is just an excuse for Dr Cullen to get his fingers deeper into the pockets of New Zealanders. Not just Dr Cullen, Dr Smith. National believes, with public support, we can defeat this new tax. 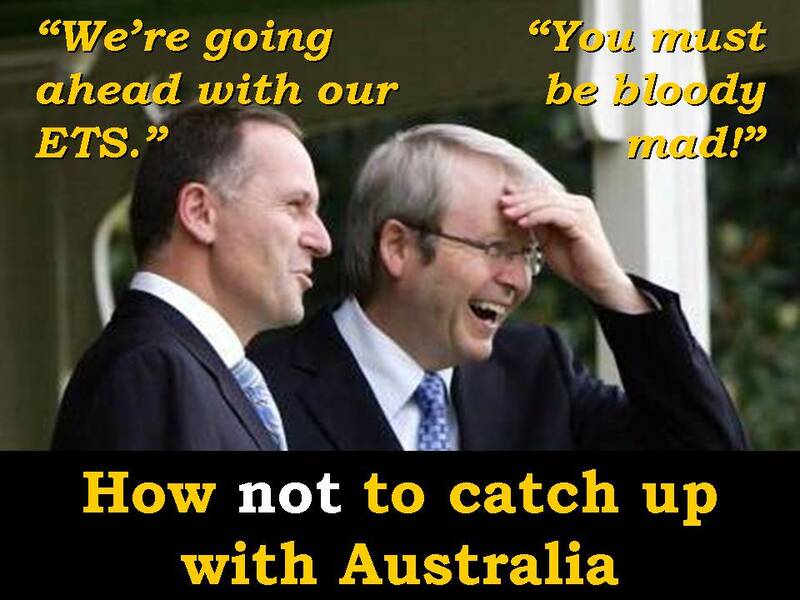 ACT, United and NZ First all campaigned against it during the Election. Labour and the Greens do not have the numbers. 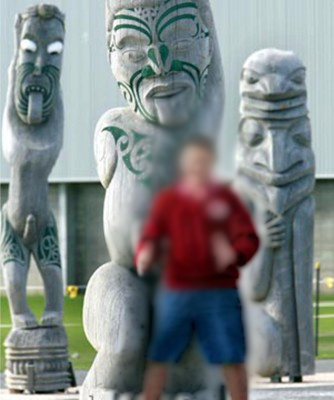 The Maori Party may determine its fate. In Parliament however, the fart tax was killed off by people power and the carbon tax could fall the same way. A major show of people power is the only thing this government would respond to. They’re certainly not responsive to common sense. On July 1, this lemon – sugared up a bit, but still a lemon – becomes law. When it does, all those bad things Nick Smith railed against in 2005 will happen. Only not on Labour’s watch. Both Nick Smith and John Key have been sent the most compelling evidence for why the science of climate change is shonky. Yet they take not a blind bit of notice. Now they’re saddling your household with a bill of $3000 a year in price rises if you’re lucky. If the carbon price rises from the initial $25 to the predicted $100, your bill will be $12,000 a year. And this from a government that says it’s main goal is to catch Australia. Looks ominous, doesn’t it? Until you read the date. I’ve always thought Lindsay Mitchell was one of our braver commentators, tackling as she does the thankless subject of welfare. Lindsay’s not a naturally rambunctious person like many political types. But those who’ve met her cannot fail to be impressed by her warmth and sincerity. She’s a volunteer, with great empathy for the women whose lives she seeks to improve. A fan of her letters, Sir Robert Jones came out to launch her ACT campaign in 2008. But as you can see here, there’s another side to Lindsay Mitchell. 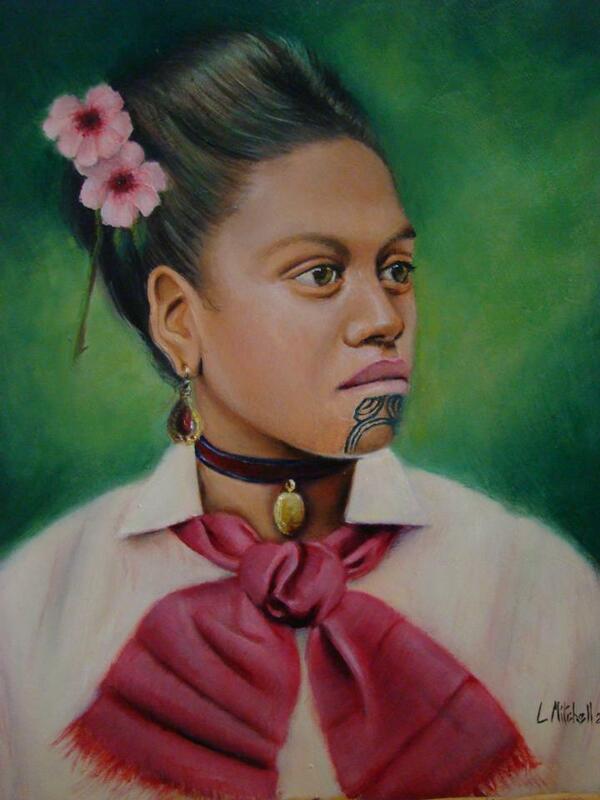 She’s a magnificent portrait painter, inspired by C F Goldie. 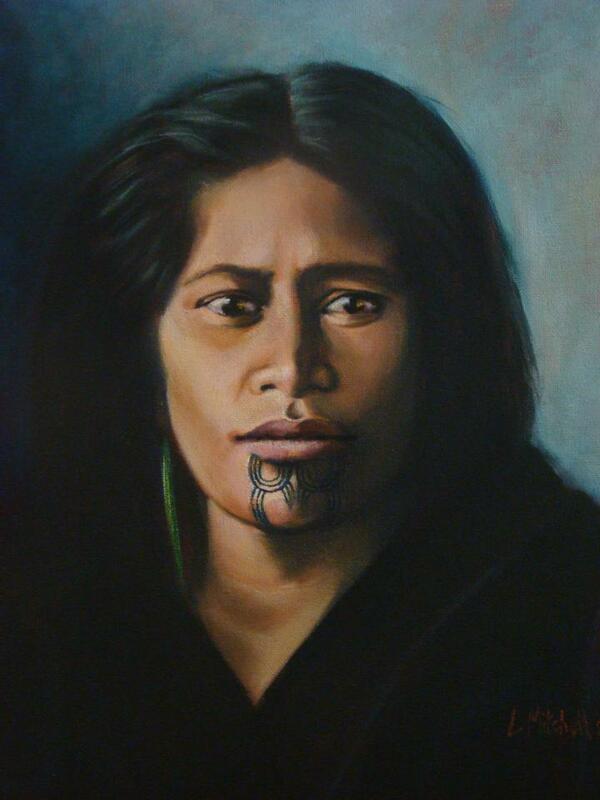 Her deep affection for Maori women may surprise those who equate a hard line on welfare with being anti-Maori. Until Sunday, a selection of her paintings are on sale as part of an exhibition at the Academy of Fine Arts on Queen’s Wharf. I went last Sunday and think it’s well worth a visit.